1. It’s really pretty convenient and simple to use. 2. You still need another tool for the rest of your non-Etsy shipping needs (if you want to avoid the post office, that is). Well this might be of interest to you… Endicia, the company behind the Etsy integrated shipping, also makes a stand-alone product that you can use to print all of your postage and shipping labels right from your computer. 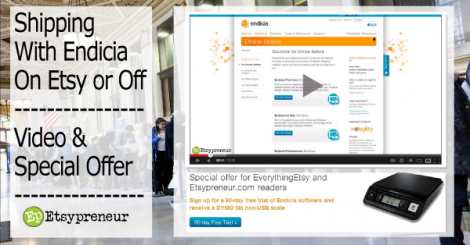 And, just for readers of EverythingEtsy.com and Etsypreneur.com, they have an amazing offer designed to make it easy for you to give them a try. 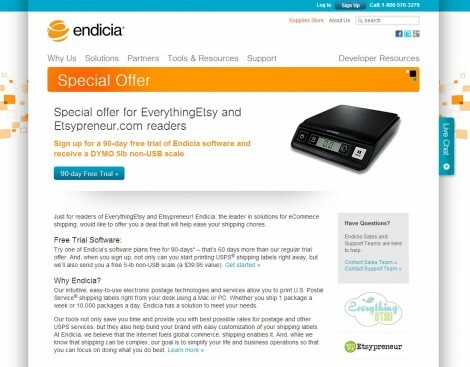 Get a free non-usb 5lb postage scale and a 90 day free trial of the Endicia software (60 days longer than the normal free trial period)! The Endicia software product, called Dazzle, lets you print all types of USPS shipping labels and required forms right from your computer. Businesses of all sizes can benefit from the range of made-to-fit offerings from Endicia, who has been in the USPS postage printing business from the get-go. You can even customize your shipping labels to include your logo! We’ve been using the Endicia Premium product for a few months and it works perfectly for us. We end up printing about half of our shipping labels using the Etsy integrated tool and half using the Endicia software. Once we get around to customizing labels with our logos, we’ll probably print them all that way. Branding is important! Or, to learn more about the Endicia products, check out this video Tim made. It’s informative and demonstrates both the Endicia software and the Etsy integrated shipping so you can decide what is best for you. PS – Long time readers know that we have strongly recommended Stamps.com in the past. Before Etsy came out with a built-in product, that’s what we used for everything and it always worked great. But since trying the Endicia product, we’ve found that it offers all of the same benefits as Stamps.com, along with a couple of additional features. If we were comparing the two today, we would go with this special Endicia offer. For one thing, the free scale is non-usb so it can be used with or without the software. The Stamps.com scale only works with the software. The other big difference is the ability to customize labels with your own logo using the cool design features of the Endicia software. I signed up with them two months ago and was scared to death to try it…. Now, I wish I had signed up a year ago! FANTASTIC and the money that I save is completely PROFIT! Don’t hesitate… I’m sorry that I hesitated because I could have saved so much more. Do you get to keep the scale if you cancel the Endicia? There’s no more scales and no more 90 day trial either.